SLICE Review: From Repo Man To Pizza Boy | Birth.Movies.Death. When Alex Cox's Repo Man was released in ‘84, the writer/director was a twenty-nine-year-old British UCLA graduate who, in all actuality, wanted to be a comic book artist when he first scribbled the punk rock/sorta-sci-fi hangout picture. That's right, Repo Man originally existed as a half-assed funny book, the adventures of wily car snatchers in an apocalyptic iteration of Los Angeles only eventually transforming into a film because Cox didn't feel like drawing that much. Scored by a mixture of surf riffs and driving rock (not to mention the classic Iggy Pop theme song), it instead became a snapshot of a specific musical epoch, while never actually featuring a filmed punk show (though there are brief band cameos), all while its outsider author sprinkled in his own experiences with the scene and a real life repo man named Mark Lewis (the basis for Harry Dean Stanton's iconic Bud). Thanks to a bestselling MCA/San Andreas Records soundtrack, Repo Man found life after its initial truncated release, and went on to become a cult classic. Austin Vesely is now only a year younger than Cox was when A24 dropped the Columbia College alum's feature debut, the hip hop horror pastiche Slice, into a handful of theaters around the country, before dumping it direct to VOD the very next day (displaying a bewilderment with the product not too unlike Universal’s unceremonious distribution of Repo Man). Though his path to getting behind the camera is slightly more traditional than Cox’s was – having befriended Chance Bennett (a/k/a Chance the Rapper), who employed Vesely to shoot a collection of his videos – Slice displays a similar infusion of a particular musical scene. 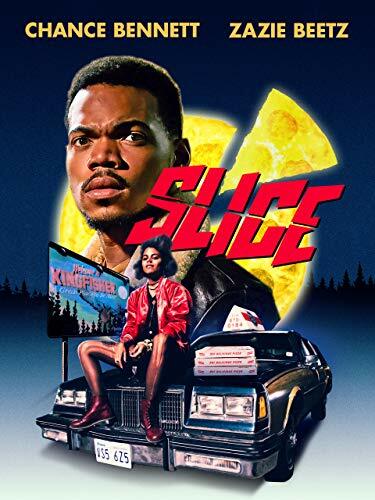 Chance posted a poster for Slice on his Instagram account in ‘14 (when, at that point, the project was only a spec script), two years before the consummate collaborators stepped on set in ‘16, ready to turn Joliet, Illinois into the fictional "ghost town" housing municipality of Kingfisher (spectral population 30,000 and growing). Thankfully, Chance had signed on to play the pacifist werewolf lead Dax, and helped give birth to this rather singular fusion of sleek aesthetics and socially-minded horror. It’s somewhat easy to see what Bennett was attracted to in Vesely's writing, which (aside from having the killer hook of being about a fast food pizza spot built over a gateway to hell) is stuffed with not-so-subtle sociopolitical commentary regarding racial divide and stereotyping. Slice sits at the intersection of genre psychedelics, Chicago scenester document, and communal statement, as Kingfisher – dubbed "the most American town" by its bumbling mayor (Chris Parnell) in a faux advert for the bustling suburb – has displaced its ghost population from the centralized community it established for itself (a haunted asylum) before demolishing the spooky structure and erecting a strip mall (containing the aforementioned pie joint) in its place. Now, the ghosts inhabit a manufactured neighborhood, while the human population holds deep seated prejudices against them, glad that some sort of segregation still remains. Slice could've easily slid into the realm of heavy-handed "message movie", but Vesely filters the entire endeavor through a glossy genre filter, creating a bizarre vision of Americana environs that's cast with recognizable comedians (Paul Scheer plays Perfect Pizza's imbecile manager, while Hannibal Buress shows up in a brief cameo as a diner patron) and a refugee (Zazie Beetz) from another musician's pet project (Donald Glover's subversively hilarious FX series Atlanta). The jokes fly fast and furious, and so do the gory murders, as a mysterious slayer starts offing the delivery people in slasher picture style, causing the fast food-driven economy of Kingfisher to panic. Who the hell could be killing off these hardworking humans? Naturally, the mayor blames someone in the ghost community for the brutality. Simultaneously, the foul-mouthed detectives investigating the case (Will Brill and Tim Decker) suspect the Parmesan cheese-dealing pushers from around the way (headed by a super fly Y'lan Noel). But Dax knows what's up, even if others have pinned a previous string of Chinese delivery murders on him, simply because he's a werewolf (but that's a stereotype, not all lycanthropes are bloodthirsty maniacs, man). With the help of ambitious local journalist Sadie (Rae Gray), the two set out to prove that the seemingly separate crime sprees are connected, and possibly the work of a coven, who's protesting the Halcyon Square strip mall in the name of the ghost community (but have their own alterior motives bubbling in a nefarious cauldron). There's an arpeggiated flow to Slice's narrative that almost makes it feel like several episodes of a series' first season, strung together where a cliffhanger marks each of its (five?) acts' respective finales. Vesely stretches his barely million dollar budget to the breaking point, using every last cent to build this odd universe, where Perfect Pizza's only undead employee (Lakin Valdez) constantly acts like a soothsayer and witches cackle and howl about the evils of capitalism. By the time we meet a janitor who's been sweeping the gate to hell ever since the asylum burned down, we're so immersed in its bizarre realm that the encounter seems totally natural. Unifying Vesely’s vision is chic, multihued cinematography from Brandon Riley that pops off the screen, as Arielle Sherman's cutting keeps every "episode" gliding into the next with a forced binge-watching effortlessness. Yet despite how good Slice often looks – even as we glimpse the seams of its modest budget every now and again (example: the makeup FX are admittedly shoddy) – the movie’s thumping score is going to linger in many audience members' brains long past the credits rolling, due to its catchy electro loops. Nathan Matthew David and Black Panther composer Ludwig Göransson (who also helped produce Childish Gambino’s "This Is America") concoct a sonic landscape worthy of Lil Chano's screen debut, hypnotically soundtracking these Mystery Inc-esque motor-scooter propelled paranormal investigations. As for Chance, if the only information you're looking to glean from this review is whether or not he can act, the answer stands as a solid "sort of?" The musician certainly possesses a distinct presence - soft spoken, smooth, and able to melt his fellow performers with warm, brown eyes. 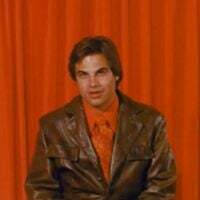 Nevertheless, there's also a relative flatness to his delivery, as you can only vaguely feel the emotion behind his lines, never shaking the fact that you're witnessing a metric ton of affectation. Still, as far as pop stars making the jump to screen, he's light years ahead of, say, Prince, yet nowhere near achieving dual artistic citizenship with the ease of Tupac Shakur. Beyond anything else, Slice becomes hilariously beguiling (not to mention improbably quotable) thanks to its genuine strangeness, which never seems manufactured or forced. Just as Repo Man transmuted its author’s rather singular sense of humor and place into a distinct worldview, Slice manages to metamorphose its wonky genre sensibilities into a chuckling statement about "the state of things", while never coming off like its straining or posturing. Is it perfect? Hell no. But Austin Vesely has concocted a rascally hybrid strain that's almost certainly going to garner a similar cult of supporters throughout its shelf life. Slice is available now on VOD, courtesy of A24.